As millions of people tuned in to watch the 85th Academy Awards, many also turned to the web to keep up with the action. Here's a look at the Oscar nominees and moments that captured the world's imagination and brought people to Google Search. At the end of the show, Best Picture winner “Argo” held the #6 spot, followed by Ang Lee, Christoph Waltz, “Silver Linings Playbook” and Halle Berry. Beyond these top five, Brandi Glanville, Amanda Seyfried, Naomi Watts, Kate Hudson and Zoe Saldana took the next top spots. This year's Oscars brought with it a number of unexpected moments that grabbed our attention. Early in the show, Seth MacFarlane was visited by William Shatner in full Captain Kirk regalia, come from the future to save Seth’s monologue; at 8:36pm ET, searches for [kirk] spiked to almost 1,500 per minute. Later in the show, “Zero Dark Thirty” and “Skyfall” tied for sound editing, and people flocked to the web with questions. Searches for [tie] spiked to more than 5,000 per minute, with many people wanting to know [has there ever been a tie in the oscars]. And in a final surprise, First Lady Michelle Obama introduced the Best Picture nominees and opened the winning envelope for “Argo.” Searches for [michelle obama] spiked to 4,500 per minute. 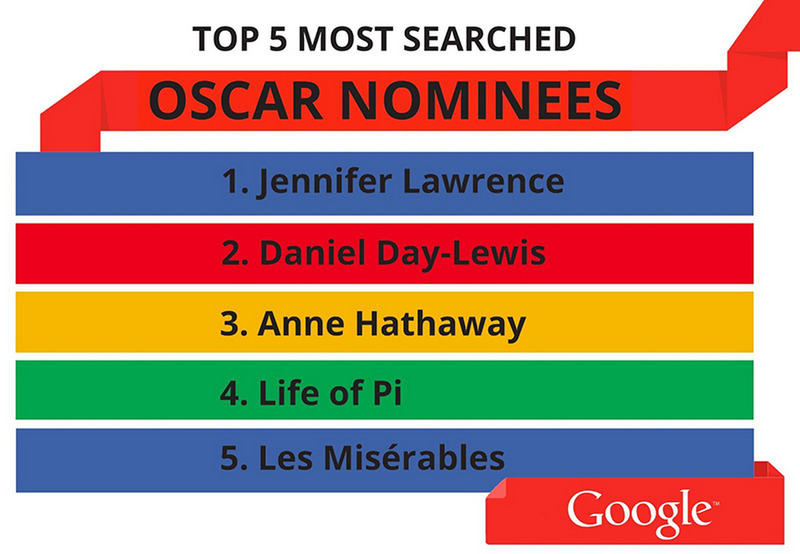 Before the ceremony started, we shared our “picks”—who would win if the Oscars were determined by search volume alone. 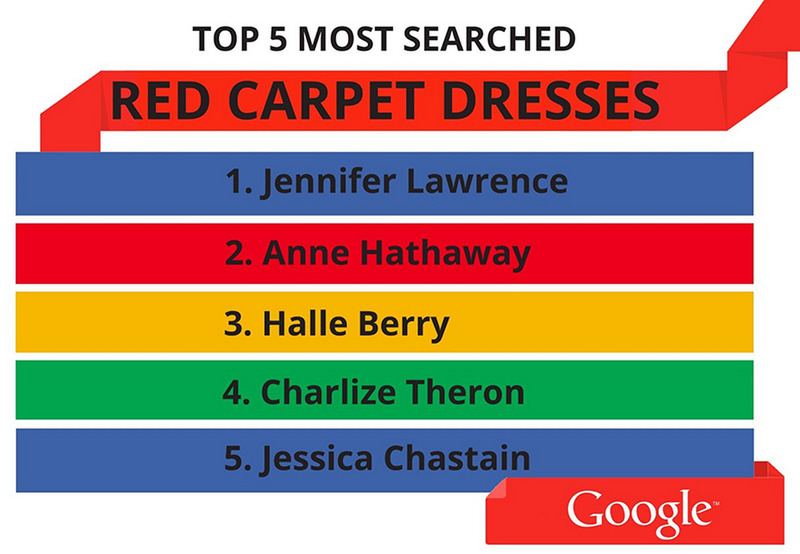 Out of the six Google Search Picks, four actually won! Visit Google Trends to explore all the topics you're curious about. And if you want one more tug at the ol’ heartstrings, enjoy a look at the year’s top movies on our Oscars site.